After yesterday’s games, the 49ers are 3-3 at their new home. The Cowboys are 3-4 at JerryWorld this season. The Jets and Giants are each 2-4 in the swamp, though granted both teams are terrible. Much has been said and written about how Levi’s, MetLife, and AT&T Stadium lack the kind of 12th man atmosphere considered a major part of home field advantage. Why is this? Jerry Jones gave a partial explanation in an interview with Colin Cowherd on Wednesday. COWHERD: (AT&T Stadium has) become such a national attraction, that there’s been a debate about whether road fans are taking over the stadium. Are you concerned about that? JONES: No I’m not. 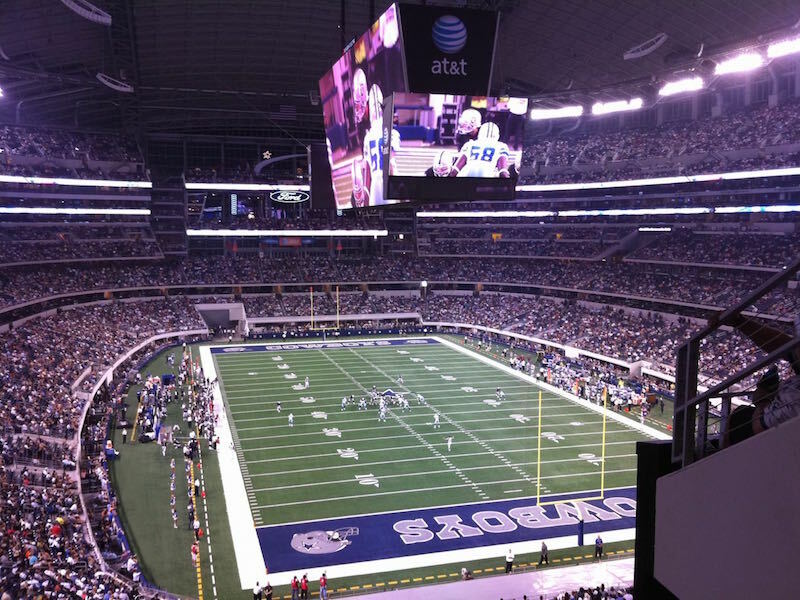 We had that wonderful game against the Giants… boy there were a ton of Cowboy fans at that thing. We do know we’ve got a lot of support. Other teams have the same issue, in that visiting teams can buy these tickets… Anyone can pick up a ticket. Our tickets have gone as high as 4 times face value for people that want to travel. And one of the reasons they give is, ‘We just wanted to use this game and come see the stadium.’ That’s part of the price we’re paying for that kind of interest. Now don’t get me wrong, I want every edge we can have to win a football game. On the other hand, it’s a lot of pride that I have and we have as an organization to have that kind of interest in our stadium. We did overdo, I say overdo I mean in a good way. If you’re as passionate about this stuff as I am… they oughta pass a law against it. We just emptied our bucket. It’s big. It’s surely impressive. Is it good? That’s debatable. The tendency to overbuild, as is this case with the newest three (aforementioned) stadia, has made the venue as much the attraction as the game. That should fade over time, as this kind of interest in football stadia – as opposed to ballparks – is a relatively new phenomenon. Football stadia are typically seen as utilitarian affairs, and while some recent iterations have become flashy, typically there aren’t scenic vistas or idiosyncracies to appeal to general football fans the same way ballparks do. Cowboys Stadium is the first truly palatial venue in the NFL, while Levi’s Stadium is the only new, swanky venue in California. If you’re a fan and you can spend a few hundred or a thousand dollars on a weekend in San Francisco (cough*Santa Clara*cough) or not snowy Dallas, it’s not a bad weekend in the least. A few teams have a large enough national fanbase that they can be expected to travel well, namely the Cowboys, Steelers, and Packers. Big markets usually have good representation on the road too. So while the media noted the number of 49er fans in Arlington for Week 1, they also mentioned the invasion of Cowboys fans in New Jersey last weekend. If you have a 10-year seat license to go with your seats, chances are you’re going to plan your attendance with care. That may mean attending every game as a die-hard, or selectively selling seats on a per-game basis. As internet-based secondary market resellers have gained popularity over the past decade, the process of buying and reselling tickets has become practically frictionless. And if you play your cards right, you can earn a decent amount of your money back. 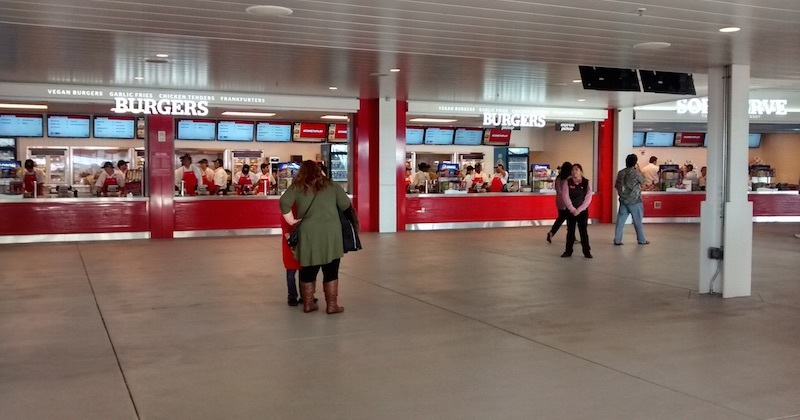 A big concourse is good for accommodating fans in the concession lines. It also serves to take fans further away from the action. Then there are traditionalist types. I know a Bears fan in Chicago who trades his annual Packers game seats at Soldier Field with a friend in Wisconsin, so that he can attend an away rematch at always-sold out Lambeau Field. As fans become more mobile and more empowered to get tickets away from normal home schedule, this phenomenon will continue to grow. Some factors such as ticket scarcity or lower capacity can help reduce the impact of road invasions. But disaffected fans have more options now, so they can be expected to exercise those options. Jones gets that. If I’m Mark Davis, I fight the urge to make a stadium opulent, whether in Oakland or LA. Focus on the basics, spend money where it should be spent (locker rooms, suite/club level) and otherwise focus on fan atmosphere, not amenities. Bring fans as close to the action as possible. Wherever the Raiders go, if they can’t ably recreate the Black Hole or recapture much of the Coliseum’s intimacy, they’ve already lost. It is possible to make a stadium too good, at least in the short term. Every team in every sport can learn the lessons the 49ers, Cowboys, and the New York teams are learning. Constrain cost, if only to limit the need for seat licenses and other lengthy contractual ticket arrangements. With the technology available, make in-seat ordering the most attractive option for concessions – to keep fans in their seats. This may mean severely or completely eliminating convenience fees in order to gain traction and fan confidence in the system. Resist the urge to participate in the club swank-out armament wars. Provide a reasonable level of accommodation and focus on service. If possible, keep as many suite levels above the seating bowl as possible. Consider a partial roof over the seating bowl to keep noise in and reduce summer sun/heat. None of these considerations will change the secondary ticket market in any appreciable way, but if there are incentives to keep fans cheering in their seats for every game, every effort should be made to work towards that goal. This entry was posted in Editorial, Football, Travelogue. Bookmark the permalink. Football is an outdoor sport. No more dome stadiums. Great post. Your suggestions would really help keep the focus on the field, which definitely helps the home team advantage. However, the cynic in me would suggest that the owners/builders of stadiums privately don’t want the focus on the field nearly as much as you and I do – they want a product that will sell in lean years and in competitive years. So they focus on some amenities that bring in casual, rich fans who perhaps don’t cheer as loud as the fans who endured cold at Candlestick. In three years, when Kaepernick’s salary is 1/6 of the entire salary cap and he’s still (probably) a mid-tier quarterback, it will be nearly impossible for the 49ers to be a playoff team. In that scenario, the 49ers still need people to pay for seats…so thank goodness for botanical gardens, PSLs, and Yahoo! fantasy football lounges. Your post also reinforces the hope that the A’s eventually build a two-deck, ~34,000 stadium with an open-air view in the outfield, the vast majority of the seats in foul territory behind home plate or along foul lines, and an overhang above that second deck for some sun protection and to keep crowd noise inside and toward the field of play. In a park of that size, you needn’t more than a few thousand outfield seats. The Cisco Field renderings we’ve seen would all conform to that model, with center field left completely open for the batter’s eye/bullpens/outdoor pavilion, and some sparse bleachers in left or right with a quirky feature in the opposite corner (e.g., right-field collonnade in San Jose, or perhaps something else that’s unique in Oakland, like high-rise condos that overlook the field from a 310-ft porch in the corner). I was at Levi’s last night. Great atmosphere and a riwdy crowd that was silenced by Kraeppy performance. I went to lasy years Seahawks game at Candlestick (and sat in the VIP seats at the Niners endzone). Love the amenities (and bathrooms) of the new stadium (including turkey legs!). I find it comical Raider fans and SF purists think the Niners lost their “soul” at Levi’s due to “techies”, while in reality, there’s probably more ordinary blue collar folks around the stadium then I’ve seen at Niners games before. Anon, I know Kaepernick’s contract (and how to write a coherent post, incidentally). I also know they can’t just cut him loose as his salary grows even with the lack of guaranteed money in his contract if there’s not a viable alternative either on the roster (there isn’t currently) or in free agency (typically bare at the qb position). The larger point is that the Niners’ current run of success, similar to the Seahawks, is strongly tied to their being able to pay their starting QB less than $1M a year. Both teams will have a harder time building a Super Bowl contender on their QB’s second contracts. Donaldson has big balls. He was An Oakland Athletic. When they castrate the team, San Jose can have the eunuchs that are left. Good riddance. Until then, they are still ours. I applaud you Josh. You said what needed to be said. We bought 4 season tickets last year. We’re dropping one next season. In honor of 3rd base. almost every game at levi’s so far many in the media are noticing and now posting pics on their twitter, instagram or any other social media site that shows the seats to begin the 2nd halves, at least a good amount of them are empty. does that happen at every other new stadium that has these big and fancy club levels. Can’t understand how New Meadowlands gets lumped in with Levis and AT&T; it’s not in the same class. Dull, featureless, amenity-less concrete bowl with no sense of place and below average concessions. It gets lumped in because it’s in the newest generation of stadiums and people like to complain about them. Specific to Levi’s, the complaints people have about it and the atmosphere are not unique. The same general things are true at other stadiums and will only become more prevalent as more new stadiums get built.